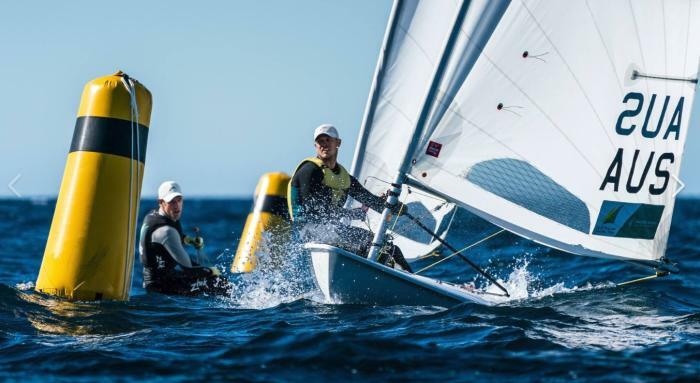 The Oceania and Australian Laser Championships concluded on 8th January. Sailed from Mersey Yacht Club the event saw 148 Laser sailors split equally on two courses (Standard and 4.7 on one and Radials on the other) sailing on Bass Strait off Devonport in Tasmania. There were a number of high profile competitors from around the world competing with top Australian Laser sailors. In the Standard Rig current Laser Olympic Champion Tom Burton NSW returned from a 3 months break. Showing his skill and with a highly consistent performance he won the event with a race to spare from last year’s Champion Matt Wearn with fellow WA sailor “Swifto” Elliott third. Photo above by beau Outteridge shows Tom and Matt in close company as they were for much of the series. Current World Masters Champion Brett Beyer gave the young guns some stiff competition and finished 7th. In the Radials current World Women’s Champion Belgian Emma Plasschaert won in a close tussle with Zac Littlewood current Australian, Oceania and World Radial Champion from WA. Third was Manami Doi from Japan. The first Australian Women was Queenslander Mara Stransky who was fourth. In an incredibly close series the 4.7’s were won by Kristen Wadley Qld by one point from Lawson McAullay WA who beat Brooke Wilson NSW by a tie break. There are pictures and videos by Beau Outteridge on the event Facebook site HERE. Beau’s video wrap of the series is HERE. The international jury were on hand to resolve the few rules issues which came up – they complimented the sailors on their knowledge and general adherence to the RRS.